Holiday Travel: How Not to become a victim of identity theft! This time of year is one of the busiest for traveling, with folks visiting family for the holidays or enjoying a winter vacation. It’s also a popular time for thieves to prey on unsuspecting travelers who are far away from home. Before you head off on your holiday adventure, be sure to take these steps to ensure you don’t become a victim. Most banks and credit card companies now offer a variety of fraud protection services including texting or calling you when suspicious activity occurs. It’s a good idea to have this service activated all the time, but especially when you’re traveling since you may not have access to your accounts at all times or be so busy that you’re not checking as often as you normally do. It’s likely you don’t need your social security card while traveling so it’s best to leave it at home. And experts suggest choosing one credit card to take with you and leaving the rest behind as well as your debit card because it stands to reason the less you carry with you, the less likely these items can be stolen. We all know to be wary of emails that ask for personal information, but what about phone calls from the front desk of your hotel or the cab company you used to get around while visiting another city? Unguarded travelers have fallen victim to these attempts at theft, because phone calls like these don’t seem suspicious. Your best bet is to ask the caller if you can call them back, then call back the number you have for the hotel, cab company or whomever called. Calling back puts the power in your hands and eliminates the possibility that you’re giving information to someone who isn’t who they say they are. A lot of us throw our wallets and phones in our back pockets and sling pocketbooks or backpacks over one shoulder. But when you’re traveling, it’s a better idea to wear purses across the body in front and keep wallets and phones in front pockets. 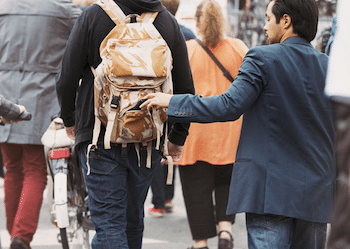 It’s all too easy for crooks to pickpocket you while your mulling through a crowd or to reach into your purse and grab your wallet while you admiring the scenery. With a tracker app installed, you’ll have a much better chance of recovering your phone if you happen to leave it somewhere while traveling. Believe it or not, many tourists forget their phones in airport bathrooms and other places. And while you could luck out and realize it before anyone has picked it up, some of these apps will also allow you to lock the device or delete files from it if it does fall into the wrong hands. Hackers can grab your confidential information as it travels over public Wi-Fi so it’s best not to use it while traveling. If you need to make a reservation or do anything that requires entering in credit card or bank account information, use cellular data or a virtual private network. Although it’s tempting to use Wi-Fi and save on data, the price you could end up paying could be much higher if a thief gets their hands on your information. Remember, if you’re traveling during the holidays or really any time of year, being aware of the dangers out there can protect you and your family from theft. Also, it’s a good idea to regularly shred outdated documents or paperwork you don’t need anymore that contain personal information before leaving home. Doing so helps to eliminate the possibility of an identity breach while you’re away. Setting up a regular shredding schedule will ensure that you never have confidential documents lying around that can be stolen or compromised, it also keeps your home or office clutter free. Call All Points Mobile Shredding today at 772. 283.4152 to find out more about our onsite shredding services for residential and commercial clients.